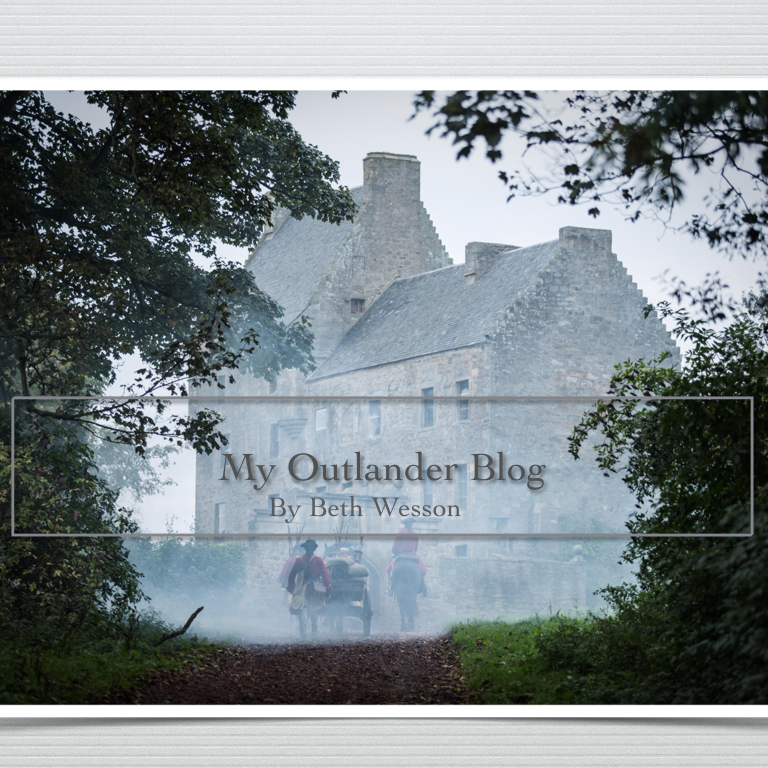 Character Counts … A reflection on Outlander Episode 11 – My Outlander Blog! Insightful as always, Beth! I regret the non-reading Outlander audience is missing out on the depth of the characters found in the books. When you know the full story it makes their decisions all the more worthy and poignant! I’m looking forward to your next blog entry! Yes, but it is my hope the series will lead them to the books! DG has a true gift! It led me to the books 🙂 I binge watched Outlander S1P1 this past February and immediately downloaded the books from Amazon and have finished all eight. I am anxiously awaiting book nine to be released as this book is reportedly supposed to answer all those pesky questions we have. 🙂 I don’t trust DG to tell us everything! She likes secrets! LOL! Wow….Love this. I pretty much stopped watching TV because so much of it is just crap. Character IS so important. The other person I have to applaud for hard choices is Ned. He is already in hot water with Colum and knows this will make his position more uncomfortable – but he is there anyway. He fights the good fight as only a lawyer can and is willing to risk himself with that mob to give Claire a chance! Thanks for this interesting view! Yes! I mention Ned but his courage was huge! He was in hot water! Let’s hope his goose doesn’t get cooked! I see you have a blog! Will follow! TY! Wow, Beth! This one is a powerhouse! Thanks for capturing so much of what I feel but don’t have the talent to put into words! You’re welcome. It means a lot coming from you because I know you read a lot of these types of things! Beth, you’ve done it again! Kudos for a great summary as usual. Beth, well said AND you nailed it. It’s a pity that there are not more shows on TV like this. I could so easily go back to the old cowboy days!!! Thanks so much for your words!! Thanks Pat! my hubby would be right beside you! this was beautifully written and a wonderful breakdown into what was really going on in this episode. I watched the whole second half with my heart in my mouth and tears in my eyes and reading your blog brought that feeling right back. The choice Jamie makes, to truly give CLAIRE a choice, shows more about who he is than anything he’s done so far. what a beautiful character he is — they both are. First, forgive me if this is a duplicate. I commented and WP asked me to log in and then my comment disappeared. 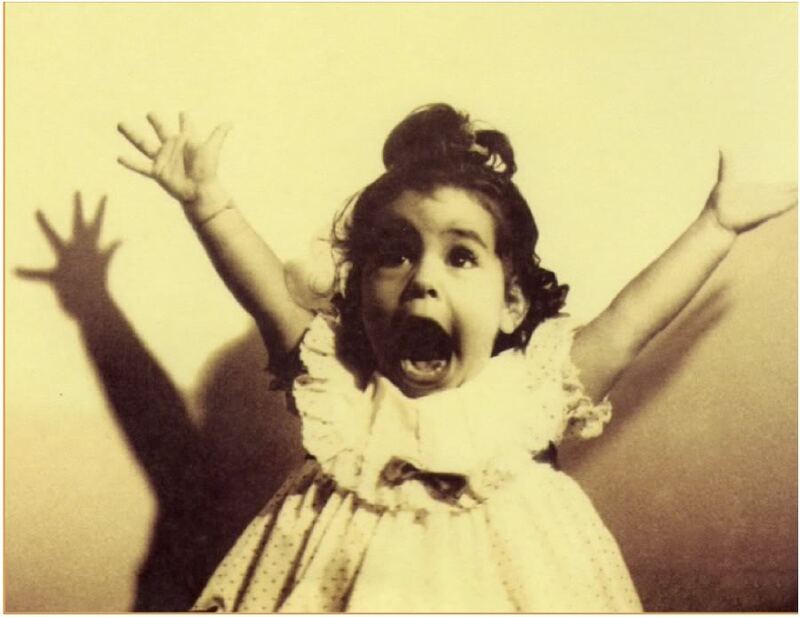 I just found your blog because Diana Gabaldon retweeted you. I’m an instant fan! This is the only post I’ve read so far, but I will definitely go back and read the older ones too. I love your insights and I feel like your observation on the character question is one of the main reasons I love this series so much– first the books and then the TV series. Seriously- I can’t stop talking about them. I can’t believe what a silly fan girl I’ve become. I wanted to add a comment and I’m interested in your thoughts, and maybe other’s. I just watched episode 11 today and I was pretty sure I saw the doubt you felt was missing from Jamie’s reaction to Claire telling him the truth. Maybe it is because I have read the books and I knew it was there, but it was all in Sam Heughan’s facial expressions. He is so amazingly expressive, and I felt like you could see in his face- there was incredulity, and then I felt like you could see him listen– hear her out– ask questions– and then conclude that she believes it is true and he decides to stand by her– to believe her for her sake, if not for his own. Again, I saw it in his facial expressions. But was I seeing it just because I knew it was there? If I hadn’t read the books, would I have assumed he just plain believed her? There is so much subtlety in the way this show is acted and scripted that I am not sure if I am seeing things that aren’t there, or if I would have seen it if I didn’t know already. Either way, yes, I missed Jamie’s “ah-ha” moment, and I found myself waiting for him to say “I saw you start to go” as he does in the book. Thanks again for the lovely blog! I thought about starting my own, but the niche has already been filled and done well! Thank you so much! I’m glad you found me and hope you follow the blog. There is a lot here to read. I agree with expressiveness and the incredulity on Sam’s face. I remember in the book Claire said Jamie had his “battle” face on. What I missed was the whole idea that even to the point where she touched the stone, he really didn’t believe even though he said he did. I believe Claire confronts him about it and forgives him because it really was tough to swallow. To me it makes his sensitivity to her needs that much more remarkable and his letting her go more real! Thanks again! Agreed! 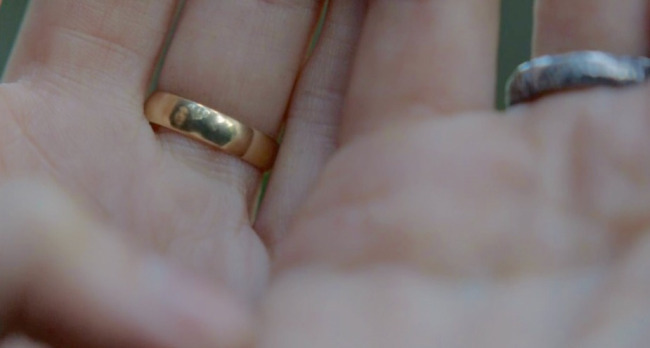 All I meant was that I felt like I was seeing that he didn’t believe her until she touched the stone. I just wasn’t sure if I was really seeing it or just imagining it because that is how the story goes in the book. And I agree absolutely. The fact that he is willing to stand by her no matter what– witch, delusional, time-traveler– no matter what, is one of the things that makes him such a noble character. Yes! Very difficult to see the story with “virgin” eyes! I think we agree! What a great blog, so smart, thoughtful and refreshing. I read some of your other posts and enjoyed them as well. Thanks! You’re welcome! Thank for reading! I enjoyed reading this very much! Character is something the world and entertainment media is lacking! Wonderfully written. My observation is that the idea of character and honor has been absent for so long from popular culture that it is hard for most people to relate to. But we fans of Diana’s writings are immersed in every heartbreaking, and glorious word. I don’t know where Ron found so many writers, and directors imbued with these sentiments, but I think this one of the triumphs of this production, and what sets it apart. I’m so grateful for their integrity! What a great posting Beth, I so agree with you!!! And for me, the same four characters stood out as well. Geillis’ bit of “hippie” rebel-all for the cause, was so there, wanting to change history and almost stop the carnage if she could! 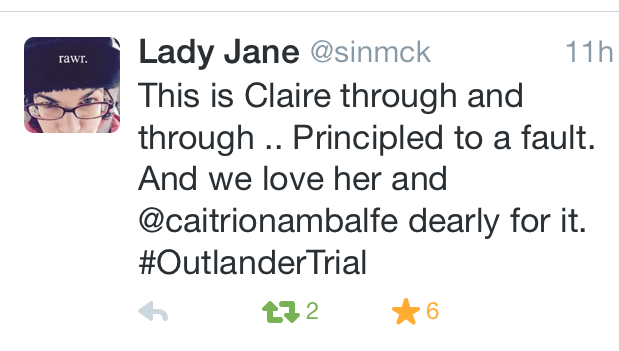 And of course, she thought Claire was there to do the same! What a disappointment when she wasn’t! But, you were right, both still had their integrity, which makes them empathetic! And Ned, what a hero! He tried so hard, pulling the gun even to save them. I love the interactions with Jamie and Claire. At times they don’t even need to speak and their faces say it all. Those two actors have such a strong connection, it’s beautiful to watch! I know the show will be different from the book, but you had Claire telling her story, full of emotion, pouring her heart out finally, and at the same time we were wrapped up in watching how Jamie would respond to all she had to say. It was perfect how he tried to understand, even with the differences. This was a hankie/tissue moment for sure. One of my most heartbreaking moments, or the start of my real crying, was the moment at the water when Jaime’s watching Claire and you know he’s made his decision to let her go home, and when he asks her, she of course, thinks home is Lallybroch. His look and choice so selfless, yet love so strong he would let her go. So hard to let go of those we love…….. I cried for the rest of the episode, it was so touching! I agree! I felt a lump in my throat during that scene as well. But Sam NAILED the last scene. The startled sob the look of awe and bending his head with tears of grateful ness streaming down his face! Have to add that I agree, that scene at the stream was so beautifully acted by both of them. The look on his face when she looked up the hill and then turned back to him, where he forced a smile so she wouldn’t see his turmoil, and then as she started up the hill, to see his face tighten up to swallow his fear. I have to admit, i played that scene over and over again. So subtle, I had lumps in my throat. The whole episode was kind of that way, especially with Geillis in the courtroom. The part where she reveal’s the mark on her arm, she stole the whole show right there. I could go on and on with parts that affected me, amazing acting by all. I always find it irritating that Outlander is compared to Game of Thrones. It should be the other way around! Diana Gabaldon’s books had been out for years before GoT written. Thank you for this wonderful commentary. Insightful. Beth, I always enjoyed reading your comments and this one hit the mark. Beth, as implied in a reply I left above, I just found your wonderful blog and look forward to keeping up with your posts. I found the books through the TV series and chose to read the first book, at least, after I watch the show. I like to be surprised. I will say that it takes repeat viewings to take in all the subtleties and rich detail so beautifully provided by everyone involved in bringing us this this production. Glad you are enjoying the show. The books are just amazing! Just recently discovered your blog ~ LOVE IT! Hello, I always enjoyed reading comments & this one hit the mark man. Well said. TV common fare lately brings a ton of complicated relationships & twisted plots, but lacking in character.